as a singer, I am becoming more & more aware of the importance of self-care. with my body as my instrument, everything that I do takes on new importance. getting enough sleep, exercising, and eating right become more than just new year's resolutions, they become essential to giving my best performances. but isn't everyone's body their "instrument?" whether you sing, play flute, dance, paint, work at a computer, or in an office, your body is your key to success. quality sleep, healthy food, & self-care don't just matter for singers, they are important for everyone who wants to bring their best self to the work they do. in light of this, I want to start sharing more wellness tips to connect the dots of process & product. at tsiimade, we talk a lot about how the energetics of process directly resonate in the product of any object, task, interaction, or performance. what better way to start off this new thought for food series than with the first meal of the day, which also happens to be my favorite meal? these two quick & easy recipes will help you refocus on starting your morning strong. they're updated old-time classics, packed with flavor & nutrition to fuel your creative fires & energize your busy days. for the best energy & nutrition, I recommend buying organic ingredients from local farms whenever possible. note: because i was a vegetarian for eight years, during which time I was also learning to cook, many of my recipes are vegetarian. some are now expanding to include organic & cruelty-free meat, but I will still include suggestions for vegetarian, vegan, dairy-, nut- and gluten-free options with every recipe. the recipes in this post are for single servings, so feel free to double, triple, or quadruple ingredients if you are serving your family or friends! almost as easy as pouring yourself a bowl of cereal, this is one of the quickest, tastiest breakfasts I know! with endless combinations of delicious ingredients, you can tailor it to your taste & dietary preferences. you prepare it the night before, so if tomorrow's a big day (presentations, gigs, getting stuff done) and you don't have much in the cupboard, you can use whatever you find there! just be sure to have oats and some kind of milk on hand. I like to make this in a serving-sized ceramic storage bowl with a lid and then just eat right out of it the next morning. or you can put it in a regular bowl & cover it with a plate or foil, or in a mason jar to take to work. simple! cover & refrigerate overnight. in the morning, open, stir, & top with fresh fruit, such as berries or sliced bananas & a dash of cinnamon. my personal preferences? lately I’ve been using a tablespoon of shredded coconut, a teaspoon of cacao powder, a teaspoon or two of agave syrup, a tablespoon of peanut butter, a dash of vanilla extract, a handful of trail mix (cranberries, almonds, sunflower seeds, chocolate chips, pumpkin seeds) and almond milk or coconut milk. other ingredients that are amazing: cinnamon, cardamom, yogurt, crystallized ginger, cacao nibs, matcha powder, he shou wu, you name it! ever since my first visit to england, I have adored this classic, protein-packed breakfast. I love any plate of food where each bite can include a bit of everything. feel free to vary the ingredients with whatever you have on hand that might add color & flavor to your plate. 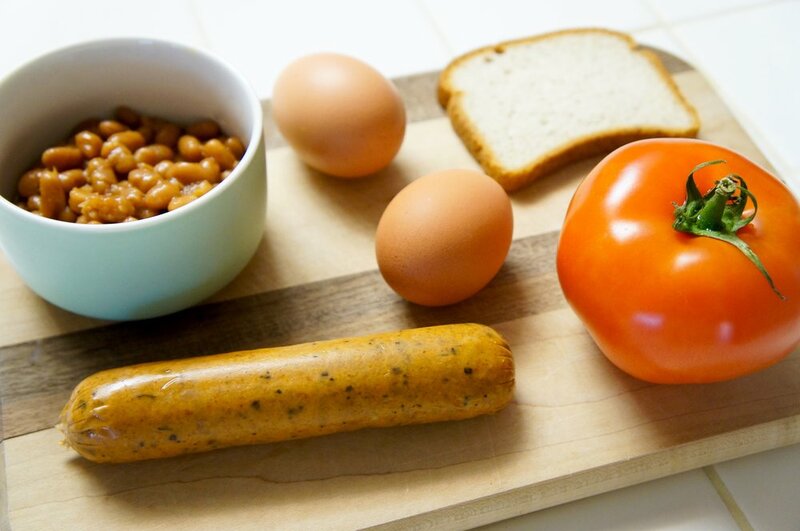 or simplify to the basics (eggs, beans, toast) when you're low on groceries. I love this one for a quick lunch or dinner as well! this recipe does involve more cooking skill, but it’s really not difficult and you will learn as you go. 1. heat a large skillet over medium heat. add olive oil & allow it to warm. 2. put the sausage into the skillet and fry for 6-8 minutes on each side. 3. meanwhile, toast your bread in a toaster or toaster oven. 4. cut the tomato in half and remove the eye. add the tomato halves to the skillet with the sausage, flipping them after 3 or so minutes, when the bottoms start to cook & turn color. 6. when your tomato halves have cooked on both sides, remove them & add your 1/2 cup of baked beans onto the skillet to warm. you're almost done! 7. place all ingredients on your plate, sprinkle with ground black pepper & sea salt, spread your favorite jam over your toast & serve with orange juice & english breakfast tea. *greens option: to get your morning greens, try adding kale, collard greens, or swiss chard, also fried in the skillet, with a dash of fresh lemon juice. this isn't a traditional part of the full english breakfast, but adds another dimension to your plate!